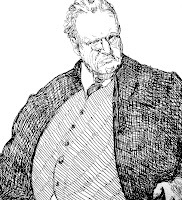 One Eternal Day: "If there is a story there is a Story-teller"
Trevin Wax interviews Kevin Belmonte, the author of A Year with G. K. Chesterton: 365 Days of Wisdom, Wit, and Wonder , a collection of quotations from one of the most quotable persons ever. And he was a Christian, a writer of Christian apologetics, an author of mystery stories, a speaker and debater, a poet, a humorist, and much more. A friend possesses a book that contains a transcription of debates between Chesterton and George Bernard Shaw — great stuff, they were diametrically opposed on religion and politics but still great friends. I just ordered the Kindle edition of Belmonte's book — it has already downloaded and I look forward to dipping in. I had always vaguely felt facts to be miracles in the sense that they are wonderful: now I began to think them miracles in the stricter sense that they were wilful. I mean that they were, or might be, repeated exercises of some will.